Memories… Some memories are like a scripture carved in stones, etched in minds like crystal clear pictures. And then there are kind of memories, like dew drops on rose a petal which melts away as the morning sun kisses them, leaving behind blurry images… Some memories come rushing like waves after soaring high waves of mighty ocean, leaving you giddy headed! And there are other memories that come fluttering like a butterfly, lively and playful but transient at the same time, bringing little flashes from past! Memories are funny! I know ‘funny’ is very unusual word to use when describing memories, but sometimes it fits the description like a tight glove. When we talk about memories, one thing that easily gets attached to them is food. Food and memories are the two faces of the coin, attached with one another and kind of becomes incomplete without mentioning the one with another! When planning for the Diwali party menu, I had a grand plan of making Carrot Halwa or Gajar ka Halwa. But the it takes to peel and grate the carrot and then cook them for long stirring continuously till my arms ached was something that made me think twice. And then there is also a fact that amount of Carrot Halwa that actually end up cooking in the end is less than one quarter amount of what you started with! This made me think again. But the pounds of fresh carrots sitting quietly on the counter top, staring accusingly at me didn’t go very well with my ‘never-waste-fresh-produce’ theory. Then there was a big nerve racking question of what to feed my guests who were about to knock our front door in the next hour! Another hard lesson learnt, not to make any changes to the grand plan at the last minute! As usual, one phone call to home and my Amma’s reassuring voice on the other end of the globe was all that was needed to calm my jumping nerves. What is it about mothers and their reassuring voice that makes everything alright?! It is like switching the light switch on and everything comes in to view, as crystal clear. When Amma suggested making Carrot Kheer or Carrot Payasam, little did I know that it will take me down the memory lane! As a kid (and also grown up kid that I am right now), I wasn’t great fan of anything that has copious amount of sugar, read sweets and pudding which also included chocolates and cakes! Yes, I was/am one of those Ripley’s ‘Believe it or not’ kind of character! So whenever I was offered a sweet dish I would simply shake my head in refusal to their utter disbelief when all other kids enjoyed satisfying their sweet tooth and bouncing off the wall after high sugar dose! So what happened next was quite unbelievable, both for me and my Amma! The night ritual when growing up was the same, dinner at least 2 hours before going to bed, an hour or two of family time with some TV time, a glass of warm or chilled milk depending on the weather, and brushing the teeth before hitting the bed! The day I am referring was one hot summer night, when the scorching day had given way to another really warm night. The ceiling fan was groaning after working non-stop for hours… The thin cotton night dress I wore just after a cold shower few minutes back was starting to stick to my back… It was uncomfortably warm and the only saviour was a tall glass of chilled milk waiting for me in fridge. At home we had our own cups/tumblers. While my dad used the steel tumbler back from his hostel days some decade ago which had lost all its shine after many years of use, my mom preferred her delicate white bone china cup and saucer with red rose climber pained around. My sister liked her very tall steel glass which she had won at school sports event being a star sports girl of the school and my baby brother loved to have his glass of milk in a stoneware cup with his favourite cartoon character. As for me, my cup was a simple brown ceramic cup shaped as a tree trunk. If I had to describe my mother in one word, it would be ‘super multi-tasker’! OK, it is more than one word, but you get the idea! She is like one little whirlwind, cooking, talking, helping us with our home works, knitting while reading her favourite book/magazine etc at the same time! Even if I scratch my head thinking for the day when I didn’t see her doing one thing at a time, I find it impossible to find such day. Sometimes with her act of multi-tasking, she kind of ended up mixing one thing with the other. And that hot summer night she ended up saving the last glass of Carrot Kheer she made for dinner in my cup instead of the regular cups used in saving the leftovers. Unknown and sleep making it difficult for me to keep my eyes open, I took out my cup from fridge and gulped a big mouthful of chilled Carrot Kheer thinking it to be my usual glass of chilled milk! 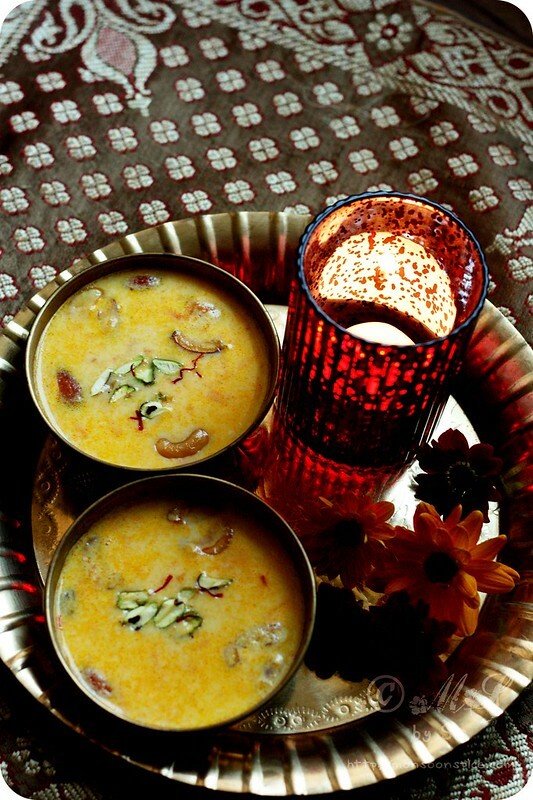 The taste… Oh that delicious tasting Carrot Kheer!!! 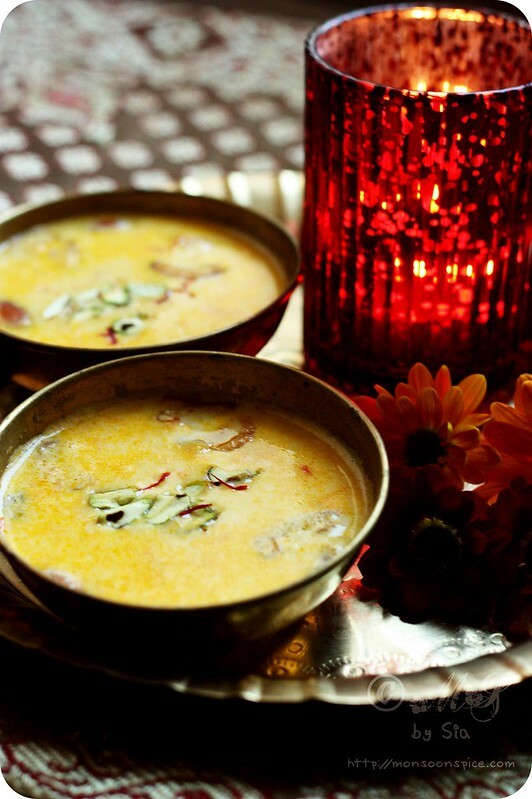 Thick and creamy Carrot Kheer with right amount of sugar, not too sweet or too bland… The crunch from roasted cashew nuts and a sweet juice from plump raisins… And then the indescribable heady aroma and flavour of crushed cardamoms and saffron! I was in heaven! Literally… the sleep taking the backseat, I went to the balcony with my cup of chilled Carrot Payasam and sat on the bamboo swing inhaling the sweet aroma and enjoying the cold touch from the cup. One sip after another sip of nectar from that cup made me forget the fact that I am actually a no-pudding person. Every sip was enjoyed and even the last drop from the cup was licked clean… I was a convert, Carrot Payasam loving girl! Next day when Amma was looking for the saved chilled Carrot Kheer, I kind of ‘forgot’ to mention about my encounter with it last night! 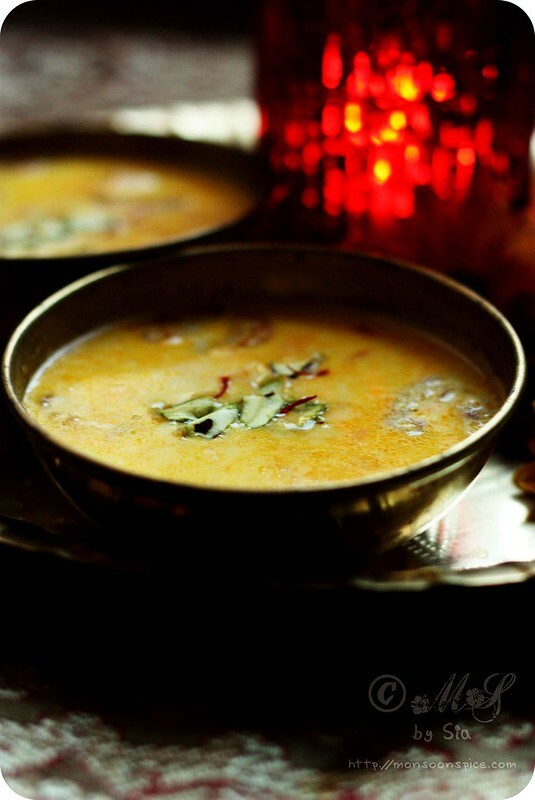 And my Amma thought it must have been either my dad or one of my siblings who polished off at night… It was only when she made Carrot Kheer a month later for a visiting friends, she learnt about my new found love for Carrot Payasam! :) From that day onwards, this absurdly delicious and creamy Carrot Kheer or Carrot Payasam remains one of very, very few dessert I like. Heat ghee in a pan/pressure cooker and add dry nuts to it. Roast them on low flame till they start to change colour and turn golden. Remove them from the pan with slotted spoon and keep them aside in a bowl. In the same pan, add grated carrots and sauté them on low to medium flame for 5-6 mins or until the carrots change colour to deep orange and their raw smell disappears. Next add milk to the pan/pressure cooker and mix them well. If using a pressure cooker close the lid and let it pressure cook for 2-3 whistles on medium flame. 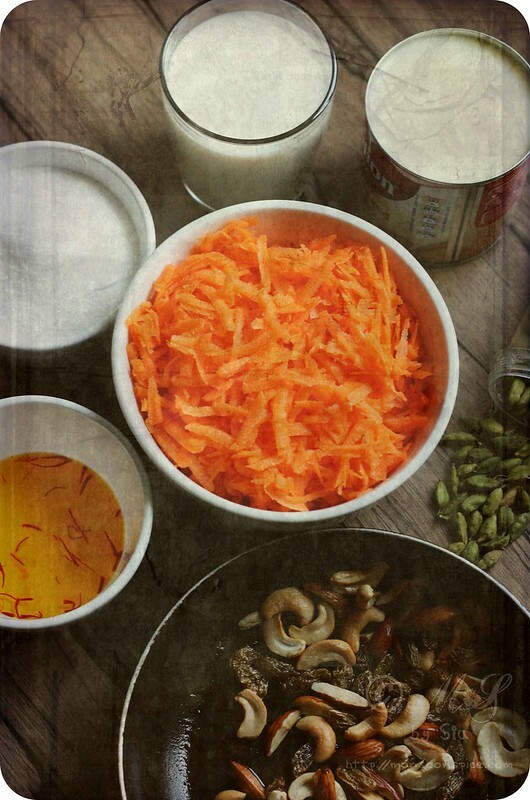 If using a pan, let it cook for 20-30 minutes on medium to low flame until the carrots are cooked through and also the milk reduces to ¾th of the quantity (that is from 4 cups to 3 cups). Make sure that you stir the mixture once in a while. Once the carrots are cooked through and the milk has reduced in quantity and thickened, switch off the flame and let the mix cool down a bit. Take half of carrot using slotted spoon and grind it to smooth paste in a mixer grinder or food processor. Add this to the kheer along with sugar and bring the mix to gentle boil, about 3-5 mins, on medium flame. 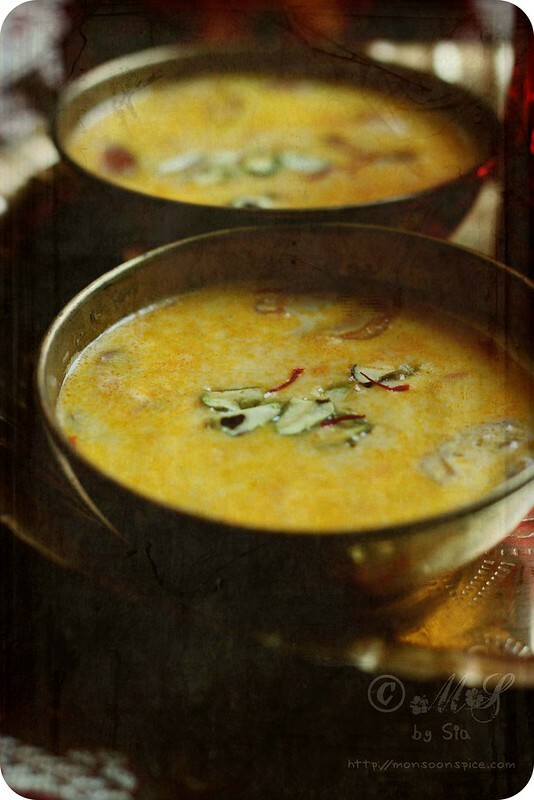 Mix in condensed milk, crushed cardamom powder, saffron and roasted dry nuts and cook for another 3-5 minutes. There is another version of Carrot Kheer or Carrot Payasa that my Amma makes by reducing the milk so that it thickens and gives the kheer very creamy base. For this take about 5 cups of milk in a heavy bottomed pan and bring it to boil. Then reduce the heat to low and let it simmer for 30-45 minutes until the milk reduces to half the quantity. Make sure that you stir the milk once in every few minutes to make sure it doesn’t stick to the bottom of the pan and gets burnt! Instead of reducing the milk, you can use a can of evaporated milk that is easily available in any supermarket. If you want a smooth and creamy Carrot Kheer or Carrot Payasa, strain the mixture by passing through sieve and grind all the cooked grated carrot to smooth paste in step 4. Add this ground paste to the reserved milk and proceed to make kheer. That looks really good. This dessert is really original. 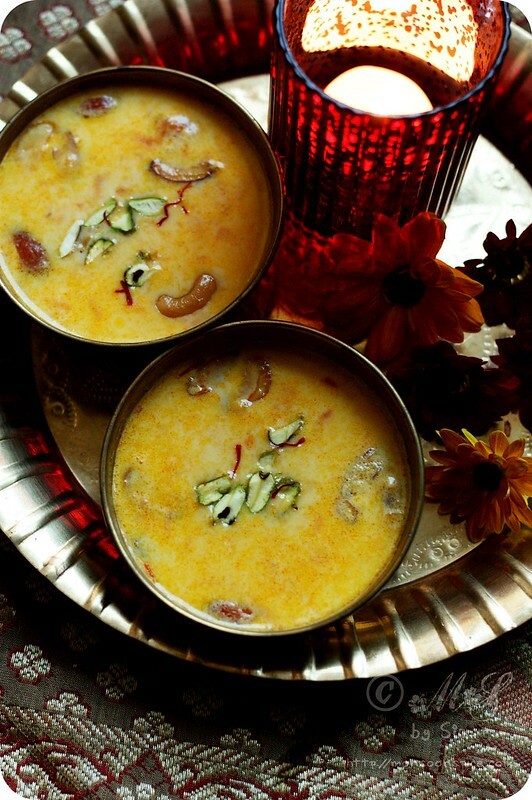 Hi visiting your space for the first time, you have a nice blog with yummy recipes..Wow kheer looks very delicious..plz do visit my blog..
beautiful pics. I loved the golden plate. My son loves carrot kheer.Will surely try this tasty kheer. Sia.. u made me all teary eyed :( i have such beautiful memories of carrot payasam. Amma made d most beautiful looking carrot payasam and this is one of those many things that i regret that i will never get to have, d way amma used to make it. guess all ammas are similar.. as multitasking as possible.. i attempted it once, never wanted to .. but could not really live without it.. it is indeed one of the best desserts possible.. thanks for reminding.. this winter definitely deserves it..
How wonderful that sounds. And if it has a vegetable in it, so justifiable! I have loads of frozen shredded carrots waiting to be transformed! Carrot payasam is looking so delicious. Such an apt, warm dessert for cold winter celebrations. Had a doubt,how much condensed milk did you use, an entire can of it? Also could you tell me the amount of milk in litres.